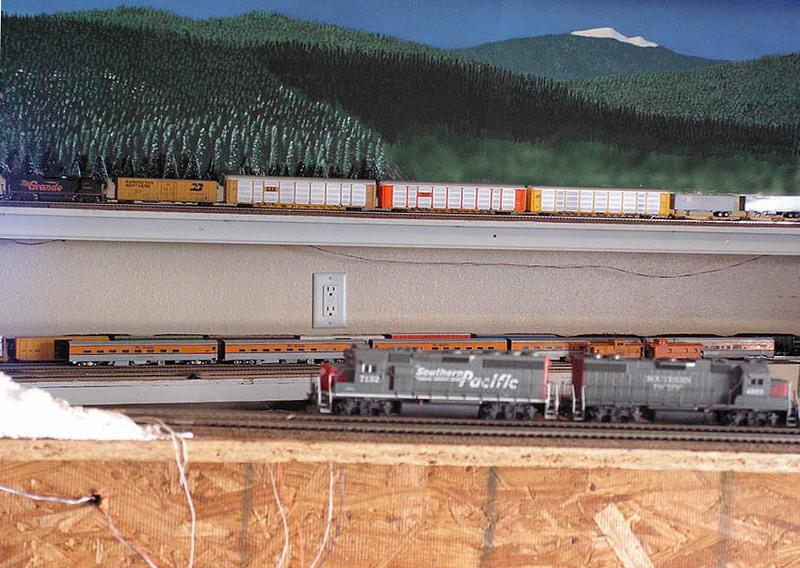 In many ways, the layout was built “on the cheap”– kind of like most of the original Rio Grande system! In this case, it usually meant that I utilized whatever materials were available. The benchwork is a hodge-podge of techniques, depending on the portion of the layout. For the most part, it’s open-grid 1X4, with cookie-cutter 1/2″ plywood for subroadbed. (Hint: don’t leave your plywood out in the rain– it tends to warp and make life miserable!) I even incorporated some structural aluminum pieces in some places. Later construction uses some 5/8″ waferboard for the subroadbed, which is the best material I’ve found yet. Several sections are made from a sheet of outdoor siding that I picked up at a yard sale, but I’ve found it to be so hard that most track nails bend before they’ll penetrate it. I ended up having to drill each nail hole. I wish I’d found the waferboard first! 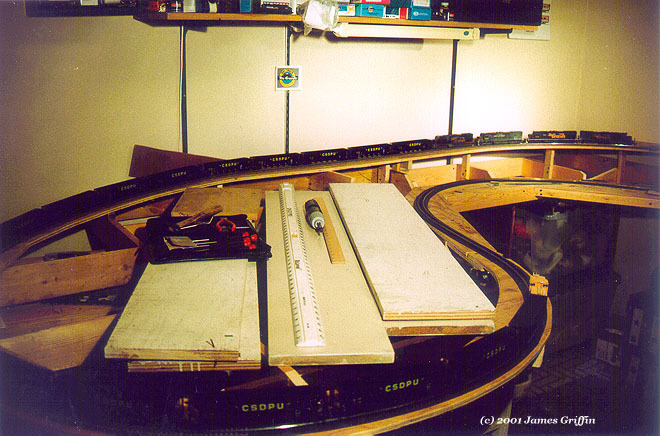 This photo shows the Big 10 area (as installed on the layout’s previous location) before the scenery was applied. It shows the 1X4 open-grid method, with cookie-cutter subroadbed from 1/2″ plywood. My roadbed is mostly cork, plus some new foam polymer variety (a mistake). North Yard is underlain with sheet craft foam, which I have found to be a far more economical method than cork, plus it looks better in yards. Track is basic Atlas code 100; I opted for cheap-and-easy, even if it’s not quite scale. Minimum curvature is 24″ radius. Nearly all track switches are No. 6, which make for smoother, better-looking operation and gentler yard ladder tracks than No. 4’s. Powered switches use Atlas snap switch motors (some of the under-the-table variety). I utilize manual ground throws on many unpowered switches. Wiring is basic 2-control block wiring, with a separate cab and control panel to operate North Yard. Leftover spools of twisted-pair telephone wire made the block wiring easy and inexpensive. Here’s an overview of the middle section of the room. In the foreground is the back side of the Plainview/ tunnel 2 area. You can see the chipboard subroadbed and support. Later, I installed fascia here, as well as a backdrop, making this view impossible. In the background, you can see the upper and lower levels of the layout. Denver North Yard is below, and Winter Park siding is above. You can see the aluminum channel that supports the upper level. The backdrop is not quite complete (that’s a lot of trees to paint!). Note how the foreground trees blend into the ones on the backdrop. The grades are evident, especially when compared to the yard section, which is essentially flat. Benchwork is essentially complete. Fascia installed in most places. Safety barriers not installed on the reverse loop yet– I need to prioritize this. Trackwork is complete except for the C&S Coors spur (a longterm proposed expansion whose future is unclear). A few mainline switch machines haven’t been installed yet. Wiring: I now have power to all track. I am in the process of running accessory power to the various structures on the layout. Having installed several streetlights and interior lights, I can say that it really brings things to life! Lighting: I have fill lighting and room lighting in place, including some blue LED lights for night sessions and some multi-color variable LED strips for time-of-day variations.